Assoc Prof Libby Lee-Hammond and Elizabeth Jackson-Barrett from Murdoch University’s School of Education will work with Burringurrah Remote Community School over the next six months to investigate teaching on Country in remote areas. 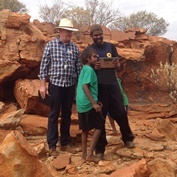 The Murdoch researchers will accompany children and teachers from Kindergarten to Year Three from the Burringurrah Remote Community School on regular class visits to sites chosen by Elders of the community. Elders have expressed the view that learning on Country held the most promise for enabling their children to reach their potential. “The relationship between Elders and children is one of deep mutual respect and reciprocity, and Elders can teach and nurture a generation of children with the skills, knowledge and values from that Country,” Lee-Hammond said. The Murdoch University researchers conducted a pilot study on the effects of the OCL program implemented in two urban primary schools in 2016, which demonstrated a clear improvement in children’s levels of involvement and wellbeing as well as their school attendance. “We have found that OCL enables children and teachers to make connections with curriculum areas such as languages, history, numeracy science the arts technologies health and education,” Jackson-Barrett said. The study, which began at the end of March, is funded by the Froebel Trust (UK).